Everyday, countless motorists become victims of car accidents on South African roads. According to a recent report released by the Automobile Association (AA), 2016 saw 14,071 fatalities on South Africa’s roads – a significant jump from 12,944 deaths recorded in 2015, a 9% increase, with over 1,120 more fatalities, year-on-year. It’s important to know which roads are considered high-accident zones and to be cautious when travelling on these roads. 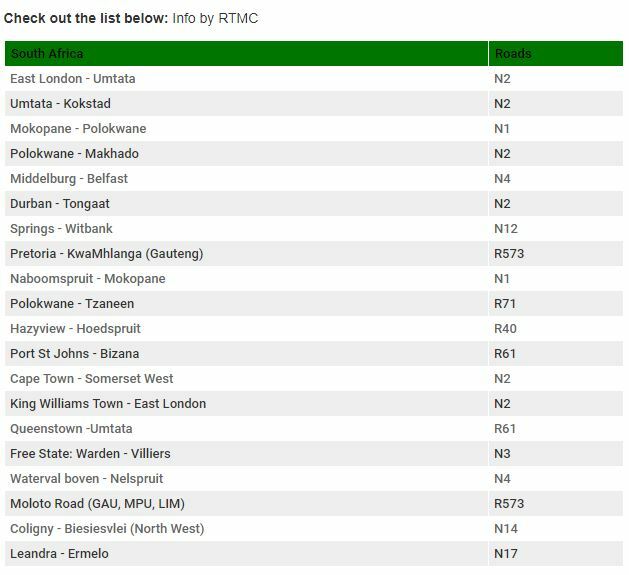 The Road Traffic Management Corporation (RTMC) has released a list of high-accident routes and we’ve included a map of the high-accident routes for easy reference. The RTMC said that driving under the influence of alcohol, failure to wear a seatbelt, using mobile phones while driving, excessive speeding, disregarding road conditions and signs are some of the driving behaviour that contribute to road fatalities. To ensure that you and your family remain safe on South African roads and are assisted in the case of an emergency, Beame Protect* offers you relief, recovery and representation in the form of Accident Assist. Not only does it provide you and your family with immediate access to the Road Accident Fund (RAF) claims management system, ensuring a 100% recovery pay-back, but it also alleviates the hassle of administrative nightmares, saving you time, effort and the dreaded paperwork. For more information, visit www.beame.co.za or contact Customer Care on 011 654-8090.